If you have a blog, whether it’s for personal or professional reasons, you’ve likely realized that keeping a blog is a lot more work than it might initially appear to be. Even after you’ve finished the initial design, there are several repetitive and particular tasks to keep it going. Staying on top of your posting schedule, researching or creating interesting and relevant content, getting your blog out there to create a viewer following or traffic, and maybe even use advertising techniques on top of everything else. But running a blog doesn’t need to be a chore—instead, you can use different apps to help you make things easier on yourself. Here are 7 essential and best smartphone apps (also for tablets) that every blogger needs to run a smooth blogging operation. Evernote is one of the great and best smartphone apps for staying organized and spark inspiration in producing manageable content. As a blogger, you can use it to write your blog posts, including image or audio files when necessary. You could use it to clip articles from the Internet to either peruse or post at a later date. You can also use it to make lists so that you meet your personal blogging goals. The app has a myriad of uses, which is why it’s so useful for many personality (or blogger) types. The great aspect about Evernote is that it syncs between multiple device platforms—if you’re halfway through a post at home, you can easily take it with you to work on-the-go. You’ve probably got a lot of personal information on your smartphone—information that you do not want out there for the whole world to see. If you’re blogging on the go and connecting to public WiFi spots, exposing your information un-knowingly is a risk that you’re taking. Additionally, your phone or tablet is subject to malware just as much as your computer. So how do you go about protecting your information and keeping your phone safe while also managing to get things done wherever you are? The answer is ExpressVPN. You’ll be protecting your information with a more secure connection that will frustrate hackers and save you from many potential threats. Curious to know how many people are viewing your blog or where they’re coming from? If you’re using your blog to create revenue for yourself, you especially need to know what’s working to drive traffic to your site as well as discovering potential improvement. Google Analytics is the best smartphone app that will break down all the accumulated views of your site—including how they were directed to your site, the duration spent on the site, what they clicked on, and so forth. You’ve set up a blog and start publishing content but how you will know about your site’s uptime and downtime? How will you get notified if your site facing any server issues or suffering hosting problem? Here comes Pingdom, It is one of the best smartphone apps that let you inform whenever your site suffers any server issues, downtimes, and outages. You can check and monitor your blog’s status with this best smartphone app. With the Pro Plans of Pingdom, you will be notified via an SMS. Many people prefer blogs with photos—photos get grabs the reader’s interest through visual incentive, along with providing a break within the text. If you’re posting photos on your blog, you may want to enhance them a bit—adjust the contrast, eliminate red-eye, etc. Instagram is a great photo app with very limited editing use, especially if you’re running a professional blog rather than one meant personal fun. Photoshop Express gives you that extra touch of photo quality to make your photos really pop utilizing many of the same tools that the popular Photoshop application provides. Alongside these customizing tools, a variety of filters are included that’ll keep you feeling creative. Best of all, this app is completely free! Even if your blog isn’t providing you with ad-generated income, you’ll probably want to make sure your friends and family know when you’ve posted a new entry. If you’re trying to generate more traffic for your blog, you probably know social media is your best friend. Going from one social network to another uploading the same posts gets pretty tedious. Instead, use Buffer to link your social media accounts together and send out updates to every platform. You can link your Twitter, Facebook, Google+, and any other imaginable social media account to this app. Moreover, you can also schedule posts for future updates. In simple words, you can get all of your social media marketing done in one fell swoop and free up your time for the rest of the week in regards to generating new content. Feedly is another best smartphone app that helps you stay connected with your favorite blogs via RSS feeds fetching. After installing this app, you need to follow your best and favorite blogs via Feedly. It will automatically update fetch the latest post from that blog. You can also save the posts for later reading. Feedly easily can be connected with other apps like Pocket, Instapaper, and Buffer. Along with these features, you can integrate it with social networks such as Twitter for sharing contents easily. Initially, it can be challenging to implement a system for creating and sharing posts for your blog, you’ll find that everything will seem much easier once you’ve put a system in place. 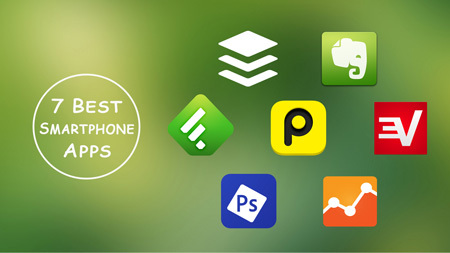 These seven best smartphone apps are must-have to help you increase your productivity and the quality of the posts that you’re putting out without making it feel like an enormous hassle.